Police arrested a San Luis Obispo man earlier today for allegedly holding a homeless woman hostage, torturing and trying to kill her last week. Tommy Sherrell Ledbetter, 46, severely beat and tortured the 26-year old woman while holding her against her will for several hours at his home on South Street in San Luis Obispo on April 1, police said. Following the incident, police found the victim wandering near Ledbetter’s home with a serious head injury, cuts and wounds covering her upper body. She was treated and released from Sierra Vista Regional Medical Center. Police said Ledbetter knew the victim. 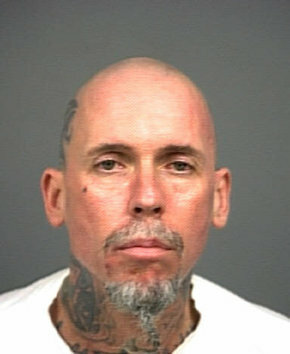 Ledbetter was booked into San Luis Obispo County Jail on an outstanding $750,000 warrant. He is charged with attempted murder, torture, assault with a deadly weapon, and possession of drugs for sale. Yet another example of why we need to outsource incarceration in CA to a private company in Mexico. We need to make prison so unsavory that it scares people straight. Not to mention, it would reduce costs by about 90%. Looks like a tweaker to me. Of course he had drugs on him, that’s usually what fights among the homeless are started for. He’ll do fine in jail and will probably end up as a shot caller in a prison gang.